Why: In honor of National Dance Week in celebration of the diversity of dance! 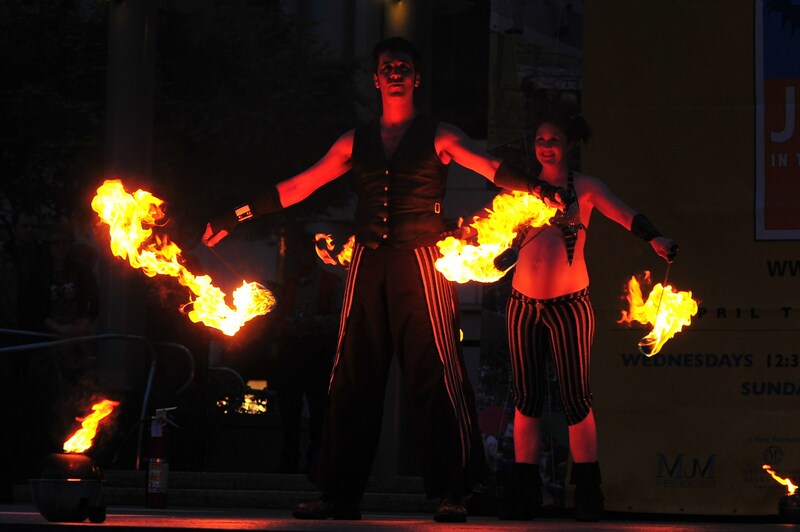 Bring a chair and a blanket and join us April 21, 2012 at 7:50 pm for our seventh annual free fire dancing show in San Francisco’s legendary Union Square (Geary and Stockton). Arrive early to ensure you have space to set up your chair. Photographers: Due to the overwhelming number of photographers we have had in years past coupled with the increase in crowd size, in 2012 we will be implementing a new means for photographers to capture great photos while not blocking the crowd. First, we will have multiple areas for photographers. Second, we will require photographers bring chairs so they do not block the front row seats. Third, photographers will need to register in advance for admittance to the photographer section. There are 25 reserved for photographers known to GlitterGirl – please contact her in advance to ensure you’re on the list. There are then an additional 30 passes that will be issued for the section on the front of the stage at the bottom of the monument. There will then be an additional group of 30 passes issued for side stage photographer sections. These additional 60 passes are issued on a first come first serve basis. Please email glittergirlpoipriestesss (at) gmail <daught> com to get your photographer’s pass. Please do not reserve a pass unless you will use it since we are turning other photographers away. Also note, photographers who do not arrive by 7:30 will forfeit their pass as we need everyone situated for the opening of the show at 7:50.
bring ear muff/hats — it’s windy!